Well October is finally here! The weather is cooling off and so are we! It was popping poolside this summer at the Daylight Beach Club at the Mandalay Bay Resort in Las Vegas, NV. From the runway to off the wall AV Vegas turned up the heat for these two incredible events. AV Vegas helped celebrate the fashion season with MAGIC with Special performances by Spencer Ludwig, and Chevy Metal led by Hall of Fame drummer of the Foo Fighters, Taylor Hawkins. It goes without saying the desert sun and heat presents its own set of challenges when working with sensitive audio visual and sound components. In the past outdoor audio used to mean settling for second rate loudspeakers and lots of amps crowding the stage to accommodate the acoustical challenges that typically come with an outdoor venue. With today’s technology there’s no compromise needed when planning a daytime outdoor event. For this event we selected the JBL VTX V20’s; JBL VTX G28 and S25 subs, powered by Crown Amps and consoles by Yamaha, the CL5 & QL5. Crown Amps and consoles by Yamaha, the CL5 & QL5. Spencer Ludwig, and Chevy Metal led by Hall of Fame drummer of the Foo Fighters, Taylor Hawkins. 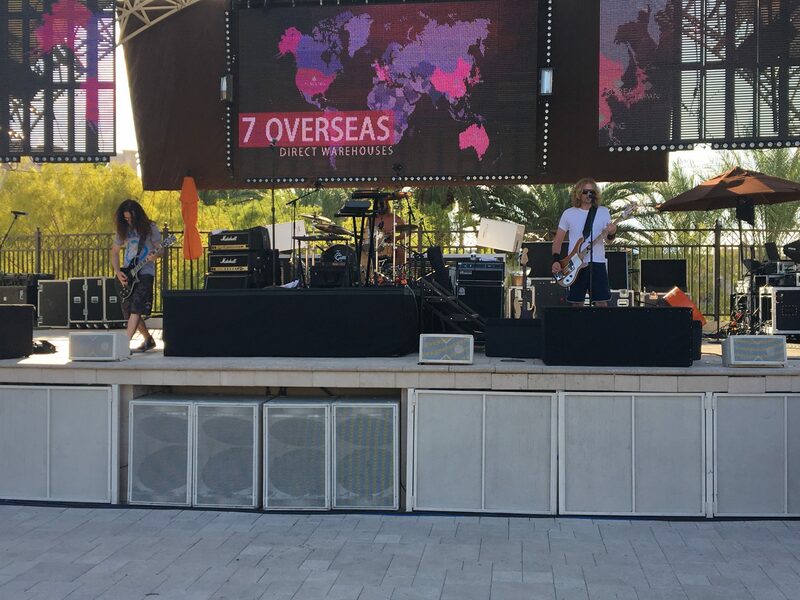 Next up at the Daylight Beach Club at the Mandalay Bay we had the pleasure to “Rock With You” while celebrating 60 years of the “King of Pop” for a special Michael Jackson 60th Birthday Celebration. For this commemorative occasion “Michael Jackson, The Diamond Celebration” we knew we couldn’t stop til we had enough…. we selected the JBL VTX V20’s and VTX G28, S28 subs powered by Crown Amps; Console: Yamaha QL1 for audio and for lighting we broke out the big guns! The Martin Viper Profiles, Quantum Washes, Mac Aura’s; Clay Paky Sharpies; GrandMA2 Lighting Console were just the ticket to make every guest a slave to the rhythm. Featured artists at this event included Usher and Mark Ronson. Take a behind the scenes look at this outdoor build. Genie Forkner October 5, 2018 . Categories: Audio Visual / Corporate Events, Backline Rental, Recent Events. Tags: Audio Systems, Audio Visual Equipment Rentals, AV Equipment Rentals, Las .Vegas. Lighting Systems, Lighting Rentals, Sound Equipment Rentals. AV Vegas took ASPIRE 2018 to the “next level” with plenty of glitz and glam for their annual Paparazzi Accessory convention in Las Vegas, NV. For four incredible days, the Paparazzi family came together in fabulous Las Vegas, NV at the Thomas & Mack Center located on the UNLV campus for their biggest party of the year! Let the load in begin! We captured this build in time lapsed video to give you an birds eye view of how 136 panels of Stageright decking, 3 large triangular custom made pieces, 128 H frames, 226 feet of custom made facia, 2 sub deck elevators all comes together with 8 hours of triumph by 10 AV Vegas #RockStars. Kicking off the entertainment was none other than pop music sensation Rachel Platten raising the roof on the Thomas & Mack Center. Planning an event in Las Vegas or surrounding area? AV Vegas delivers the best in audio visual, stage, lighting and backline rentals in Las Vegas. We are a full service backline & instrument rental for any band, any time, any place! We’re bringing today’s trends and tools in audio visual technology to life for events all over Las Vegas. We are your audio visual solution! Please browse through our website and get to know the name behind the show and what we can do for you, your brand or your event. Genie Forkner September 30, 2018 . Categories: Audio Visual / Corporate Events, concert sound, Recent Events, Stage Lighting. ✌️ filled the Clark County Government Center Amphitheater for the 17th Annual Reggae In The Desert festival. It was once again AV Vegas’ pleasure to bring our expertise in Sound Systems, Stage Lighting, Backline and Video to bear for this event. Featured Artists at the Reggae In The Desert festival included Collie Buddz, Third World, Kabaka Pyramid, Cocoa Tea, Ras Kronik, Mighty Diamonds, and Iya Terra. One of the best perks of providing sound, lighting and back-line for events in Las Vegas is working in some of the best venues in town. The amphitheater at the Clark County Government Center is definitely a hidden treasure in Southern Nevada. This outdoor amphitheater is 280 feet in diameter with a 50 foot diameter concrete stage strategically located on an acre and a half of land and can easily accommodate lawn seating for 3000 guests. Acoustically speaking this venue is sublime. The vibe of this event may be chill but with AV Vegas it was “Boombastic”! We chose the following components to “stir it up” and bring the “bam bam”. Guests at this event enjoyed the sweet sounds of Caribbean music, specialty foods along with arts and crafts from vendors all while listening to the sweet sounds of melodies pure and true. Genie Forkner September 21, 2018 . Categories: concert sound, Outdoor Concert Sound, Recent Events, Stage Lighting. Tags: AV Vegas, backline, Concert Ctew, concert sound, Stage Lighting, staging.